Rifles: Mod. 70 Classic Briley Custom .375 H&H and Mod. 70 Classic .338 Win. Mag. 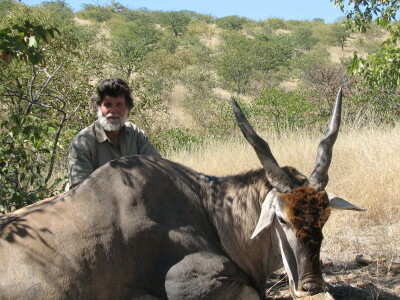 I returned from a leopard/plains game hunt with Vaughan Fulton Classic Safaris on 6/10/06. 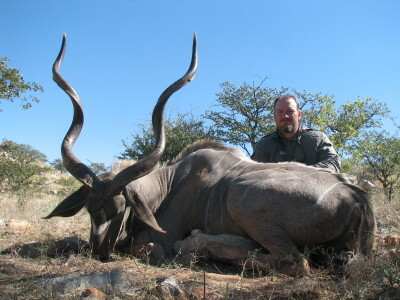 This was my first hunting trip to Africa, so I had high expectations and was not disappointed. I flew from Phoenix, AZ to Houston, TX on 5/24 where I met up with Bill (THAT TEXAN here on AR). We then flew to Frankfurt then on to Windhoek. I would highly recommend this route; I had less hassle getting my rifles into Namibia than I do when I fly back to Texas to go deer hunting. The only trouble I had was in Houston when I was checking my bags onto Lufthansa. The ticket agent asked me how much ammo I had and I told her it was a little less than eleven pounds. She said, “You’re only allowed to have 5 kilograms!” I responded, “Five kilograms is eleven pounds.” She stared at me for a few seconds then said, “We’ll check into that.” The porters put my bags on the conveyor belt while the ticket agent walked away and went into an office, leaving me with mental images of her digging frantically through metric conversion tables while my bags continued their inexorable journey to the cargo hold. We arrived in Windhoek and were met by Vaughan’s PH, Gert van der Walt. Gert took us to Vaughan’s house where we met Vaughan and Fred Bezuidenhout. We reviewed the particulars of the hunt and our expectations, then I got in a truck with Fred, Bill rode with Gert, and we drove about six hours to the tented camp on the Ehi-Rovipuka Communal Conservancy. 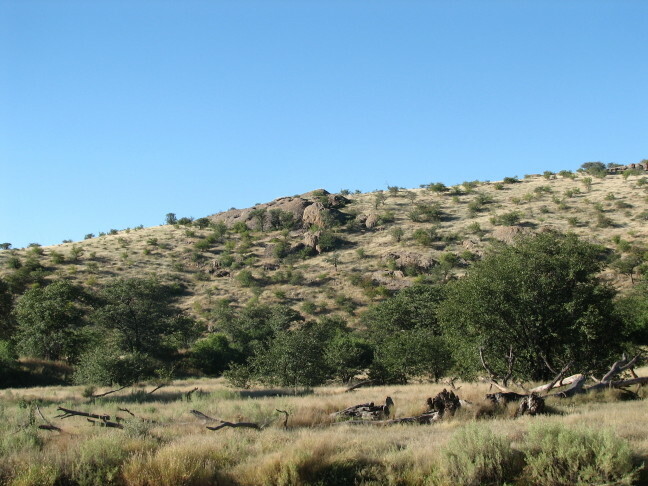 The terrain just to the North of Windhoek is a lot like that of South Texas: flat with thick, thorny brush; as we got farther North the terrain became more varied with abundant mopane trees and some gorgeous rock outcroppings. I noticed there was a lot of grass and the trees were still green. Fred explained that this year Namibia had its best rainy season in over twenty years. As I discovered later this was a mixed blessing: it made for beautiful views and pictures, but the game was harder to find and the grass hid the rocks which made both walking and driving rather interesting. We arrived at camp after dark at about 7:00pm. We got settled into our respective tents and then had a few post-sundowners and some dinner. To paraphrase Crosby, Stills, and Nash: I saw the Southern Cross for the first time. I have wanted to see this since I was a kid. I was born and raised overseas and have lived, traveled, or worked over most of Europe and the Middle East, but had never been South of the Equator until now. Checked the sighting on my rifles; both were still perfect. 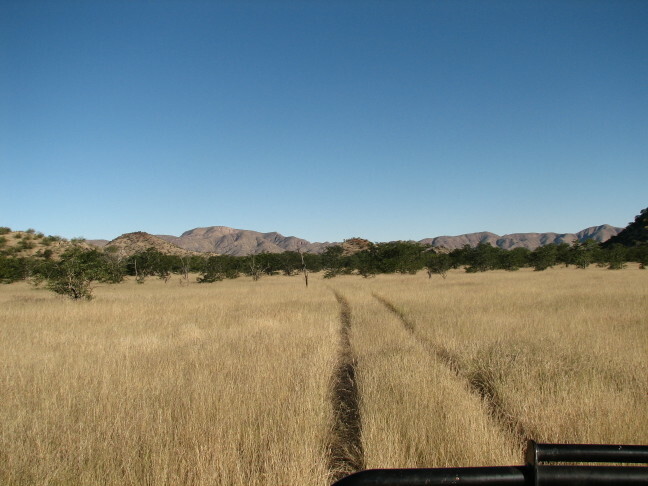 We then went looking for mountain zebra, so we would have some leopard bait. 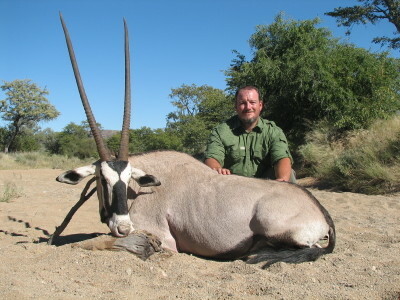 Fred told me that the most important thing to remember about hunting mountain zebra is just because that is their name does not mean I have to shoot one on a damned mountain. We tried two stalks on different herds of zebra that were in the plains, but the wind was swirling and got us both times. A little while later we spotted two stallions half way up a mountain. We stalked about 500 meters, and then ran out of good brush. I had brought my binoculars on the stalk, but left my range finder in the truck. I estimated the distance at 200 meters, and asked Fred if he thought that was right. He said they were at about 300 meters, but I misunderstood him and thought he confirmed my 200 meter estimate. 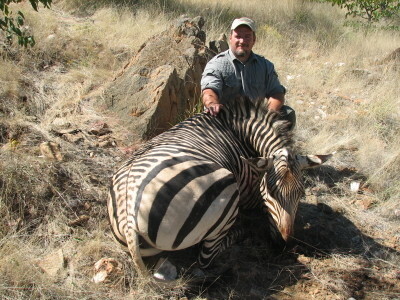 My .375 was set for a 200 meter zero, so I put the crosshairs on the zebra’s shoulder and squeezed the trigger. All Hell broke loose on the mountain. My shot was about 10 inches low and hit the front leg at about the knee. The zebra couldn’t climb, but was running horizontally along the mountain while I threw shot after shot at him. 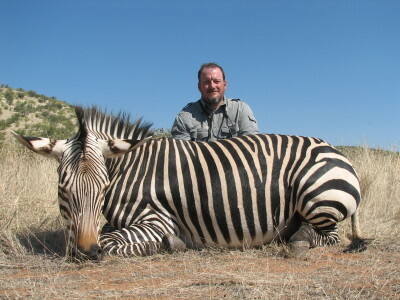 Fred told me to calm down, I was shooting low, the zebra was a little over 300 meters, take a deep breath and shoot. I followed his instructions and dropped the zebra. Hunting will keep you humble! After this I never took my binoculars on a stalk, and kept my rangefinder clipped to my ammo belt at all times. Even after the embarrassing display of marksmanship, I was very excited to have my first African animal. Fred and I shook hands and then realized we had not followed his initial advice, “You don’t have to shoot mountain zebra on a damned mountain.” After much climbing, cursing, bridge building, dragging, and lifting, we had my zebra in the truck and headed back to camp. We scouted for places to hang leopard baits. We found a lot of sign along a particular river. There were three different leopards working about an 8km stretch. We hung three baits at promising looking spots, and all agreed that the first bait was our most promising site. There had been a big leopard coming past this tree the last two nights. Our tracker, Elliot, said this would be the place where the leopard would eat. Checked our leopard baits; we had no hits, but there had been a large male within about 150 meters of one bait and a female with two cubs near another. We spotted a large bull oryx about 600 meters away and decided to stalk him. We had gone about 200 yards when a couple of smaller oryx walked past us at about 40 meters heading in the direction of the bull. We continued our stalk, and spotted a big cow about 100 meters to the left of the bull. We got within 175 meters of the bull, set up the shooting sticks, and I started to line up the shot when the oryx that had walked past us in the brush spotted us and started running. The bull didn’t see us, but he took off as did the big cow to his right. Fred and I wrote it off as a busted stalk and walked back to the truck. We continued on our drive to check our final leopard bait. We were entering a dry riverbed close to where the oryx had ran when Elliot and Ben (tracker and assistant respectively) started yelling, “Gemsbuck! Gemsbuck!” and pointing across an old fence that had been washed out by the rain. Fred told them we could not hunt on that property so not to worry about it. When Fred started to drive on Elliot and Ben started yelling again. Fred said it must be on hell of a big Gemsbuck they wanted us to see, so we both got our binoculars and started looking up the river across the fence. They continued to yell and point across the washed out water gap; while Fred kept asking them where it was standing. Finally Ben got out of the back of the truck and threw a stick at the far bank of the river on our side of the water gap. There lay the big cow oryx tangled up in the wire that had been washed out by the rain. She was not moving, so we didn’t know if she was alive. We walked over to look at her, as we got close she started struggling to free herself. We decided we could not safely free her, so the best thing to do would be to shoot her. I had my .375 and fired a bullet through her heart. 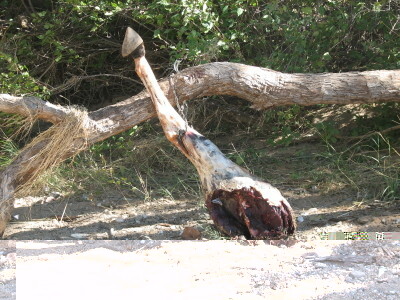 After this, we were able to piece together what had happened: the oryx had all ran up the river and followed a trail up the bank, this cow had missed the trail and hit the strung out wire with such force that is stunned her and whipped her head to the right so hard, she had speared her right hip with her right horn. It’s a damn shame she had to go down this way; she was a beautiful animal with 41.5” horns and 7.5” bases. Bill and Gert had car trouble yesterday, so Bill rode with Fred and I this morning to check leopard baits. We saw tracks, but no hits on bait. We were on our way back to camp to check on the other truck when we spotted a huge springbuck. I don’t want to go into a lot of detail on this and spoil Bill’s hunting report, but suffice it to say that Bill got an absolute monster springbuck. On our way to check leopard baits, we spotted a couple of klipspringer on some rocks in the valley below us. I shot the male from 150 meters with my.375. He is a great looking animal! I am going to have Jerry Huffaker do a full body mount. Fred and I checked the baits; no hits and no tracks. We spent the rest of the day scouting other areas to bait. We didn’t really hunt this day, but we did see a lot of wildlife. 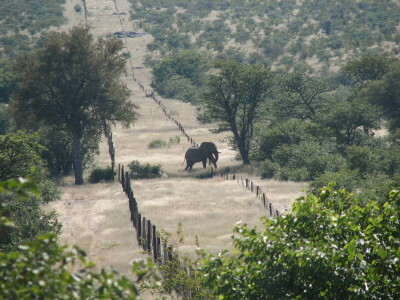 On a side note, the elephant in the picture is crossing the same water gap where the oryx cow got tangled in the wire. 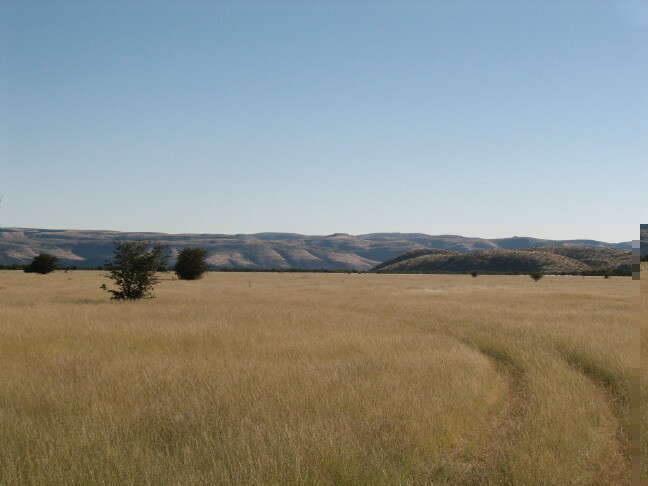 The high fence in the picture is the “veterinary fence” it spans Northern Namibia from East to West and was built to control hoof and mouth disease. I don’t think it can be doing much good, because probably 10 to 20% of the span I saw had been torn down by elephants and the rest was in such poor repair that the animals, both wild and domestic, moved freely through it. We needed some bait for a new site we found the previous day, so we decided to go check our baits early and then head into the mountains to try to find a kudu or eland. As we were on our way to check the final bait we saw the tracks of three eland bulls that had crossed the dry river earlier in the morning; we checked the final bait (no hits) and decided to track the eland. We started tracking at about 8:30am. 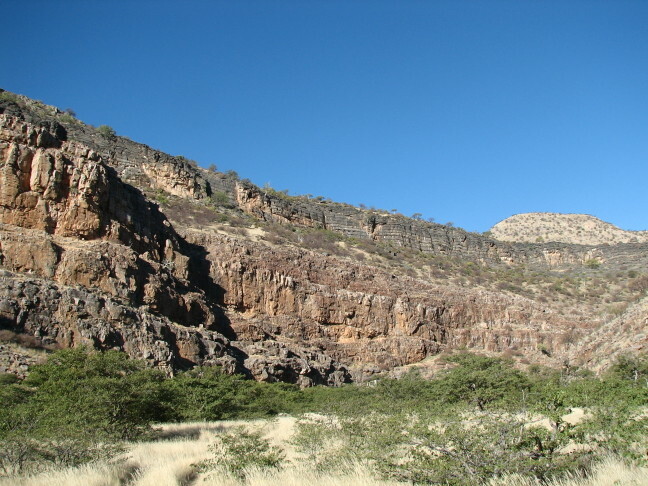 The first couple of hundred yards was easy, but then we reached a rocky area at the base of a mountain and lost their trail. 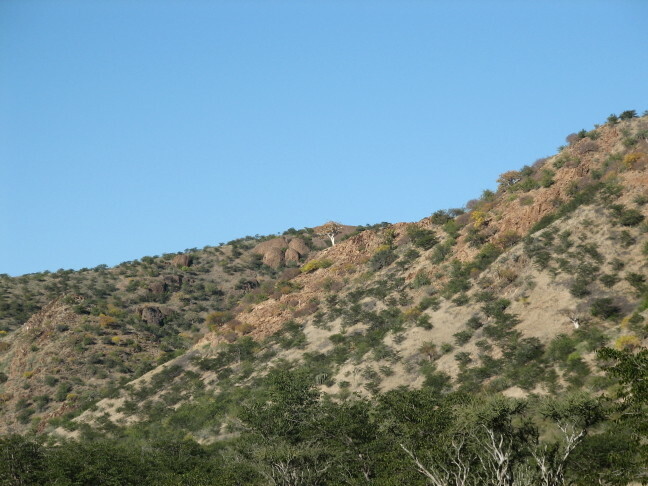 There were two mountains with a draw running between them; Fred decided we should go up and over the one in front of us and see if the eland were in the valley on the other side. Just as we were reaching the top of the mountain, Fred spotted the eland standing on the other mountain at the same level as us. They were about 600 meters away and directly downwind. The three were still together and we got a good look at them through binoculars: one was young: the other was mature and had some very nice horns; the final one was very old, with beat up horns and a massive body. This was the one for me! They couldn’t see us, but, because of the wind, they could smell us. They milled around nervously for a few minutes then started walking back down the mountain toward the river where we had picked up their tracks. We tried to cut them off and get a shot, but by the time we made it down our mountain they were nowhere to be seen. We glassed for about 15 minutes and decided they must have doubled back and gone over their mountain to the next valley. We went up their mountain and when we got to the spot where they had been standing Fred spotted them on the other side of the river in a large draw between two hills. Back down the damned mountain! We finally got above them and the bull I wanted was bedded down in some shade at a little over 200 meters. I couldn’t shoot because a small bush was blocking his shoulder. Fred said we would have to wait for the sun to continue to rise and move his shade, then he would stand up and I could take him. After about 45 minutes he stood up and I put a 270 gr. Barnes TSX in his left shoulder; he ran behind some brush, and then we saw him go down. We waited about 10 minutes and walked to where he had fallen. He was not there! He had not come out of the draw, so Fred stayed on one side, I walked to the other, and we started walking up the draw. We had gone about 100 yards when Fred started yelling for me. 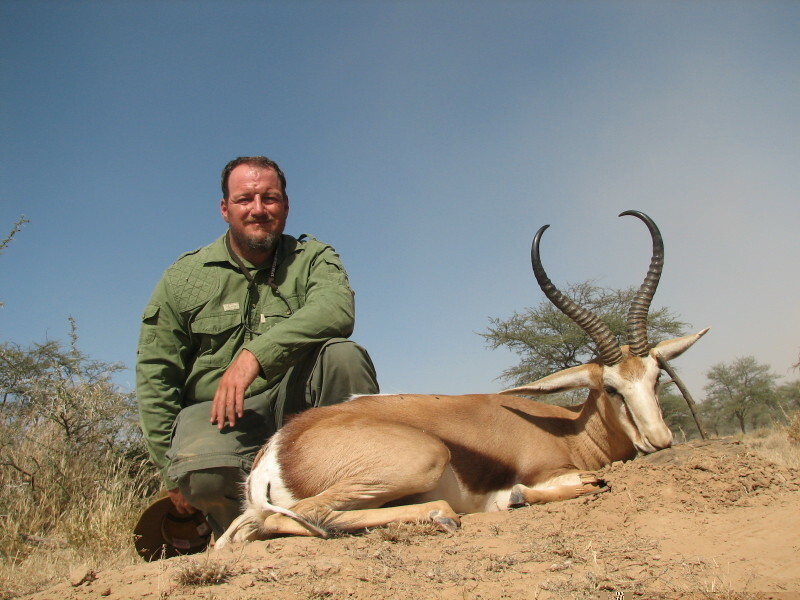 I ran down my side of the draw and up his side; when I was about 40 yards from Fred he started yelling for me to shoot the eland. 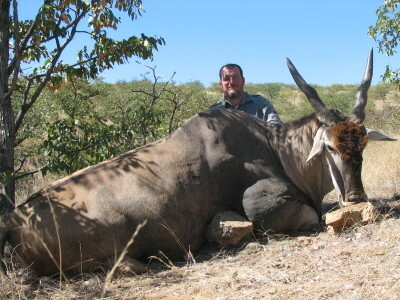 I yelled back breathlessly, “Let me get there damn it!” I made it to Fred, he pointed back down the draw where I had just run, and said, “Now shoot the damned thing!” There stood the eland at about 30 yards; I had run right past him. Don’t ask me how I didn’t see the 1,800 lbs antelope as I ran past. I fired a shot into his right shoulder and he went down again. He was lying on his side, so I put one more shot between his front legs to finish him. We had started this stalk at 8:30am and it was now a little past noon. The easy part was over, now we had to pack this thing back to the truck. Fred and Elliot went to get the truck while Ben and I started caping the bull. 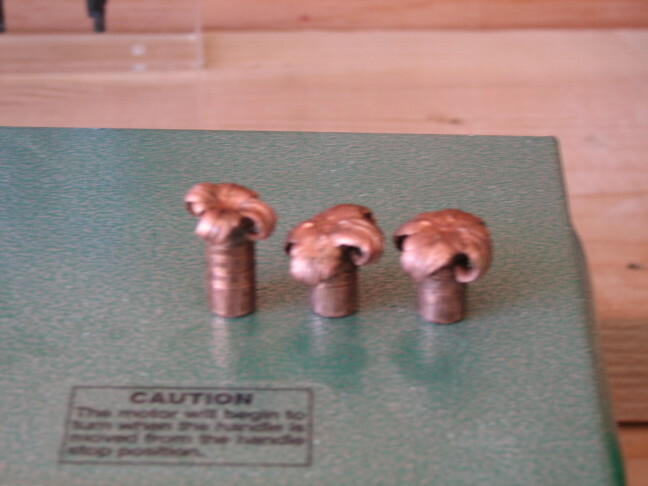 I recovered the three bullets: the one on the left was fired from 202 yards, the one in the center from about 40 yards, and the one on the right from about 8 feet. These are 270 gr. Barnes TSX; their recovered weights respectively are: 269.5 gr., 269.7 gr., and 269.9 gr. Fred had managed to get the truck within about 250 meters, but we had to go up and over a ridge to get there. I decided I was going to pack out a hind leg. 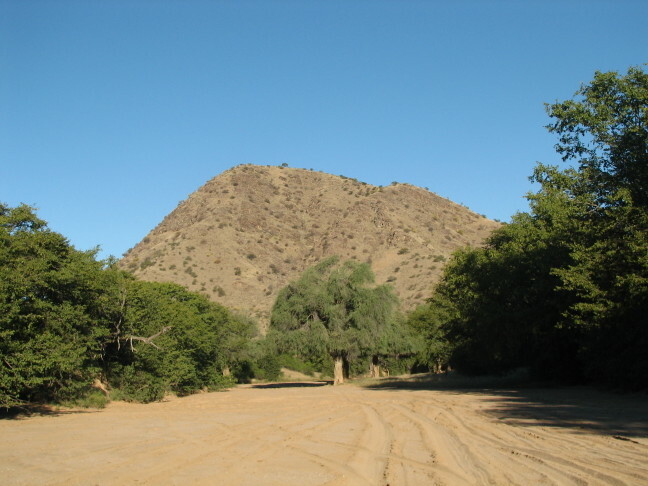 Everything was going well until I topped the ridge and started going downhill; I hit some loose rocks and the next thing I know I am skidding downhill at a rate that would make an alpine skier proud with a 120 lbs eland hind quarter on my shoulder. 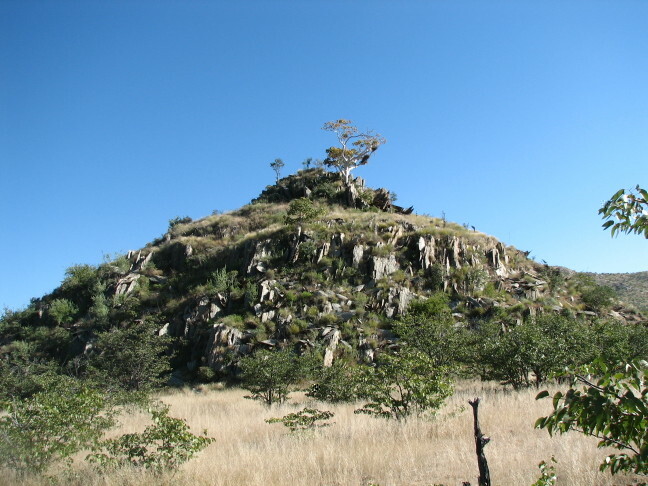 I skidded to a stop on a flat rocky outcropping, and sighed with relief. This feeling of well being lasted about two seconds then my feet went out from under me and I fell directly into a sitting position with my legs hanging over the outcropping. I looked around quickly hoping nobody had seen me, but I heard Fred laughing and knew I was screwed. I cracked my tail bone in the fall, but that did not hurt nearly as much as my pride. Fred, Elliot, Ben and I hung another leopard bait. There was a lot of leopard action last night, but no hits on bait. We bumped into Bill and Gert; they had seen a nice kudu while they were checking their baits, but Bill had already got one a few days ago. Fred and I decided to go look for the kudu. 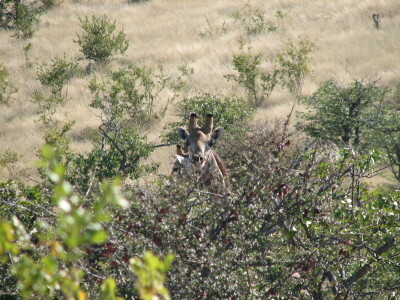 While we were on our way there Elliot spotted a good kudu standing in the shade on a mountain. We climbed (literally) an adjacent mountain and were able to get within about 80 meters of the kudu. 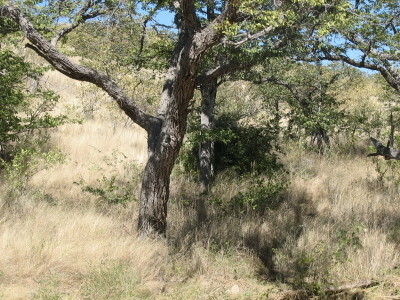 It was about 12:30pm and the midday sun was beating down on us; the kudu was back in the deep shade of some mopane trees. I crawled behind a rock and rested my .338 on a tuft of grass; it was as steady a rest as sandbags on a bench. He was tough to see in the shade, but I put my crosshairs behind his shoulder and squeezed the trigger. The kudu ran out of the shade and headed over the ridge. Fred and I assumed I had hit him, so I fired a couple of shots as he ran to try to anchor him. We walked to the trees where he had been standing and didn’t find any blood. Fred asked if I had missed and I told him that there was no way I missed; I had put the crosshairs right behind his shoulder. Fred said, “You couldn’t have put them behind his shoulder he was facing you nearly head on.” Then we realized what had happened: standing in the shade he looked to me like he was broadside, facing to my right, with his head turned looking at me, so I had put it behind what I thought was his shoulder and shot. Actually I had put the crosshairs behind his hip and shot the bush behind him. We walked to where he had gone over the ridge and found some blood. Damn! One of my running shots had hit him. We tracked him for about 1.5 km then he came out of a draw about 300 meters in front of us. Fred set up the sticks, my first shot hit some brush and hit about 6 feet in front of him, and my next shot dropped him where he stood. He is a beautiful old bull; his horns are only 49”, but they are chipped and broken from years of fighting so have a lot of character. My running shot had hit him behind the knee on his back left leg; the killing shot had hit him high on his left shoulder. We recovered the bullet from the killing shot under the skin of the opposite shoulder and could not figure out what had happened. The Barnes TSX had failed to expand. We looked at the entrance wound and figured out the cause. 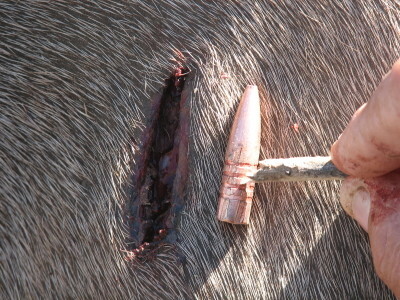 My bullet had hit some brush and entered him as shown in the picture below. We found a branch about the diameter of a pencil on a small tree that was broken off where the bullet had gone through. 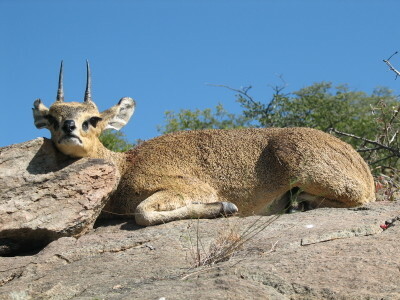 We decided to go to the Omatendeka Conservancy today and look for springbuck. The wind was howling, so most of the springbuck were lying down on the plains with only their horns sticking up above the grass. I ended up getting a really nice springbuck that measured 16.5”. I used my .338 and shot him from 140 meters; he dropped in his tracks. The wind was so strong that the others didn’t even hear the shot and continued to mill around until we got close to them. 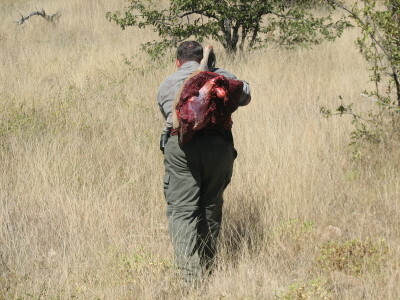 We took the springbuck meat to Omarumba and gave it to the chief; then went to check leopard baits. No hits on bait, and it was tough to tell if there had been any tracks because of the wind. No hits on our baits this morning, but a huge leopard had sat under one of them. We could see the outline of his tail in the sand. 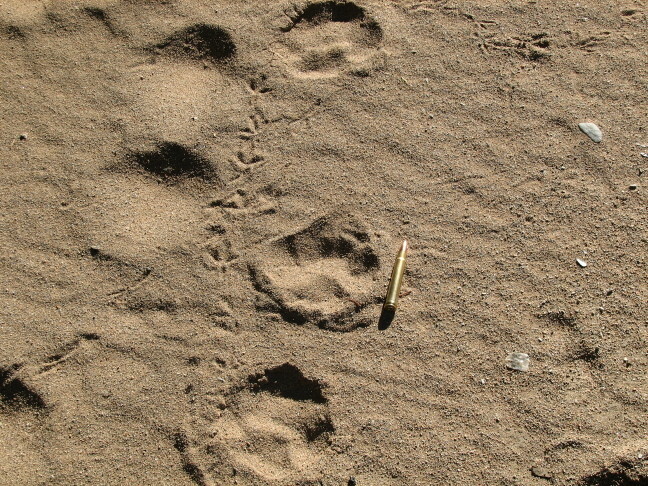 When the trackers first picked up his spoor it was so large they thought it was a female lion! We decided to sit in some brush that evening and watch the bait in case he comes back. I wanted another mountain zebra, so we drove to the edge of the Tagatora plains and climbed a small mountain so we could glass. We spotted a small herd of zebra and two oryx about 1 km out on the plains. We stalked to 250 meters and I took a big stallion with my .338; he dropped immediately. Fred congratulated me on getting it right this time and not shooting a mountain zebra in the mountains. 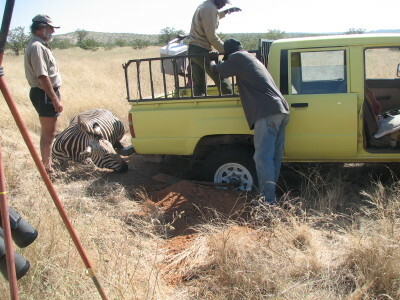 They are much easier to load on the plains, especially if you dig holes for the back tires of the truck. 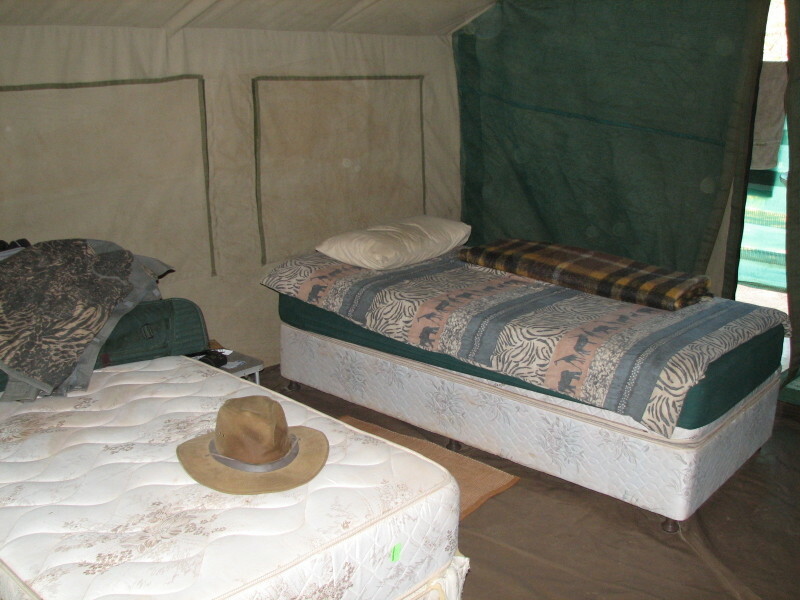 When we got back to camp, Bill and Gert were getting ready to go sit in a blind. They had a hit on one of their leopard baits! Again, I won’t spoil Bill’s report by giving all the details. Fred and I sat in the brush that evening, but did not see anything at the bait that had been getting the most traffic. 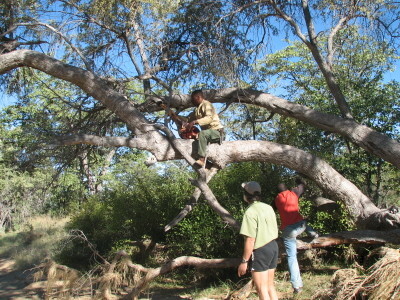 The huge leopard had come back to the bait after we left, but did not get into the tree. Fred decided we should move the bait to a limb that was about 2’ off the ground, so the bait was actually partially lying on the sand. The huge leopard hit the bait! He had come in early in the evening, because his tracks around the bait were nearly obscured by bird tracks from that morning. We placed a pop up blind and covered it in brush. 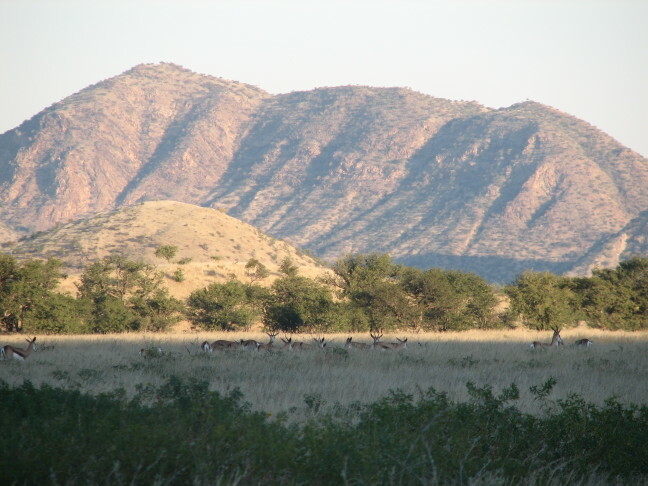 We got in the blind at 3:00pm; about 5:00pm when the sun went behind the mountain some kudus on the mountain started barking. Fred said this was their warning call and that the leopard was probably on his way. After about 15 minutes the birds started raising hell with something. Fred whispered that he is coming. 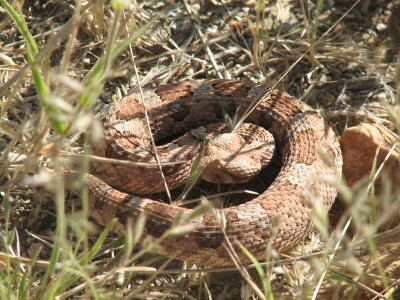 It sounded like the birds were following him along a dry creek bed that ran behind our bait tree. 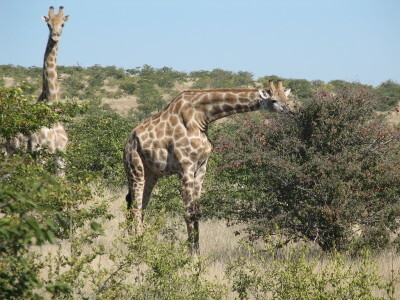 They stopped moving about 200 meters from us and continued scolding whatever they were following. After about five minutes they started to move away from us. Damn! Damn!! We sat until after dark, and then went back to camp. We checked all the baits and had no new hits. We spent a few more hours driving around so I could take some more pictures. Back at camp I started packing up my gear. Tomorrow is the last hunting day, so I decided if we didn’t have a new hit we would head back to Windhoek so I would have some time to shop for gifts and souvenirs before my flight. No hits this morning. Fred and I were both disappointed that we didn’t get a leopard, but it in no way dampened my enthusiasm for the safari. There were leopard in the area and I know Fred and I gave it our best effort. That’s hunting. Fred Bezuidenhout was my PH; he is a great guy and excellent PH. He has some amazing stories including one about a leopard attack (he attacked the leopard), and will do everything he can to get you an opportunity at game. Fred is an honest and direct person, which I greatly appreciate. 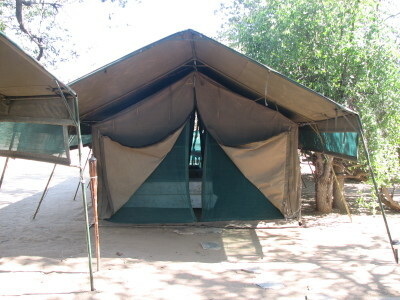 The camp was exactly what I was looking for: a classic style tented camp with no luxurious lodge. 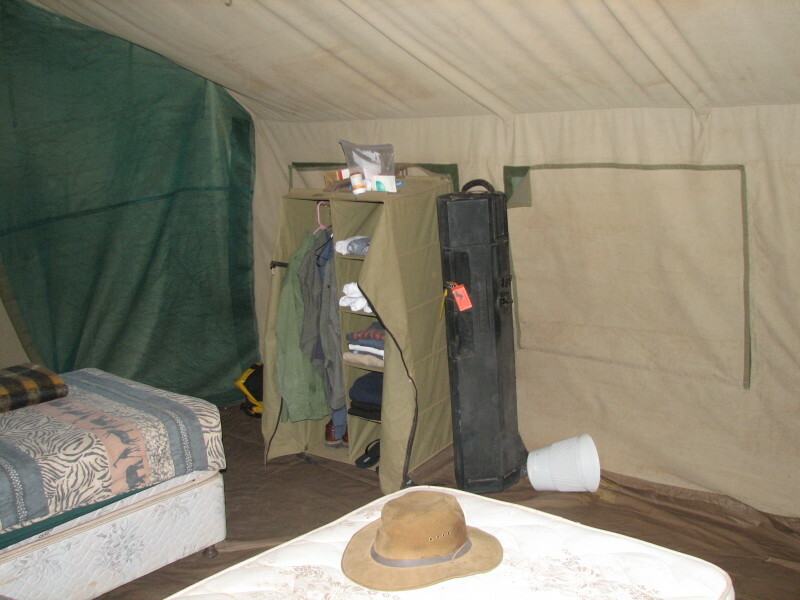 The camp was clean and well kept; the tents were in good shape and the beds were comfortable. 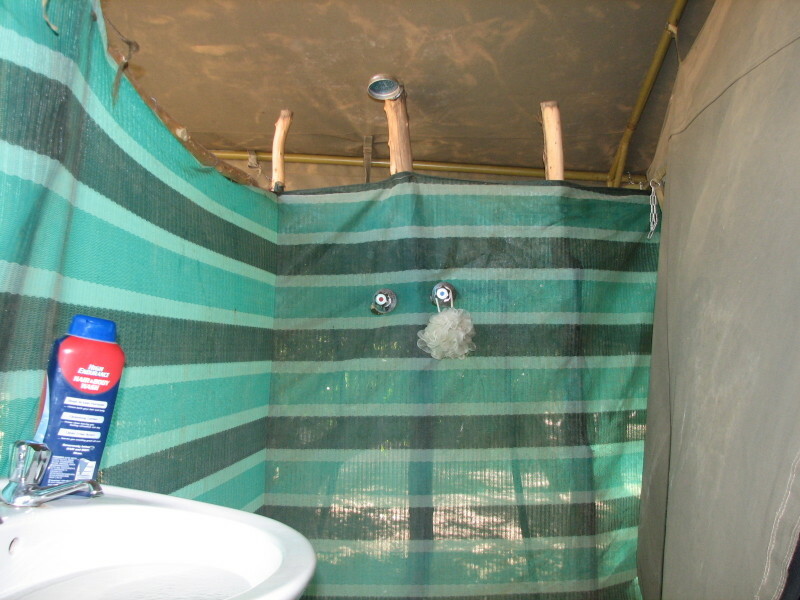 Each tent had its own shower and toilet. The food was very good, and Lena, the cook, made some of the best fresh baked bread I have ever tasted. I thought about ditching some of my gear and seeing how many loaves I could fit in my duffle bag. She’s got Panera Bread beat all to Hell. I was lucky because of all the rain. The landscape was beautiful and I took a bunch of great pictures. I would definitely recommend Vaughan’s operation to anyone who is looking for a classic, tented safari. I plan on hunting with him again. I also recommend Wendell Reich as a booking agent. He did a great job for me and I am already talking to him about a hunt in another part of the world.